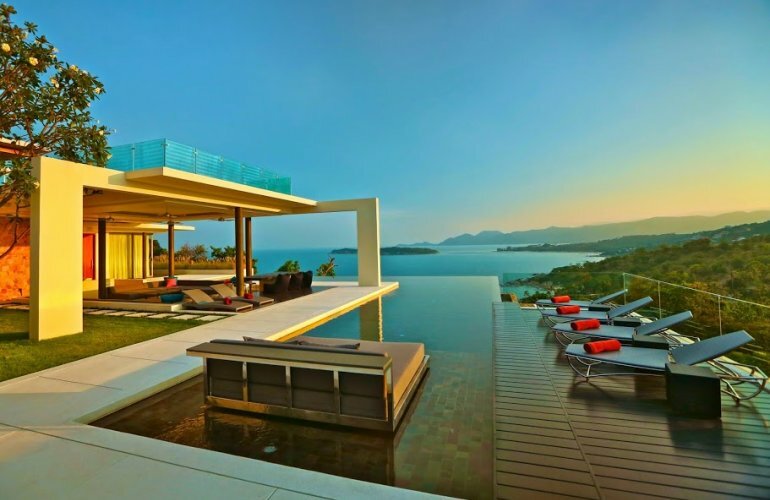 To call this villa stunning would be an understatement – it is quite simply one of the most spectacular vacation homes in Koh Samui. Nestled in an exclusive hill side location in Choeng Mon this exceptional home is sure to take your breath away. This ultra-modern ‘smart home’ oozes style and sophistication from every aspect with an array of sublime design details. From the floating pool bed and sunken dining room to the plush cinema lounge and chic social spaces, you’ll be in awe for every day of your stay. An expansive open-air living room spills out onto the stunning sun deck and island surrounds, allowing this sensational home to blend brilliantly into its exquisite hill side location. The palm-fringed garden and patio are home to a generous oceanfront lounge, luxury sun beds, a sunken dining room, BBQ and bar area. A double pool day bed ‘floats’ in the impressive indigo infinity pool and guests are sure to be impressed by the spectacular sea views and distant islands beyond. The pool also boasts a glass bottom viewing window lending an extra impressive edge. To the far end of the sun deck lies a state-of-the-art kitchen with a minimalist finish and designer dining area. Floor to ceiling doors open out onto the whitewash sun patio allowing light to flood in for an exceptional entertaining experience with unsurpassed pool and sea views. This uniquely designed home is the ultimate spot for a celebration with endless social spaces arranged over its three fabulous floors including a rooftop sunset lounge and bar. The villa boasts a plush games room reminiscent of a private gentleman’s club, with pool table, wine lounge and state-of-the-art cinema. There’s also a private air-conditioned gymnasium and masses of indoor and outdoor living space sure to inspire and astound. Four king-size bedrooms are located across the lower and ground floors, each equipped with designer furnishings, smooth tiled flooring and en-suite bathrooms with rain showers. The bedrooms enjoy prime ocean views with slide-away walls, private furnished patios and cutting-edge design details. Luxury bathrobes and slippers are provided in each of the bedrooms, as are hairdryers and room safes.